Export Rows: Exports data to a .csv file for the rows you select. Use Shift-click to select multiple rows. Clear all filters: Turns off all filters you may have set for each column. Go to date: Displays historical fill data. 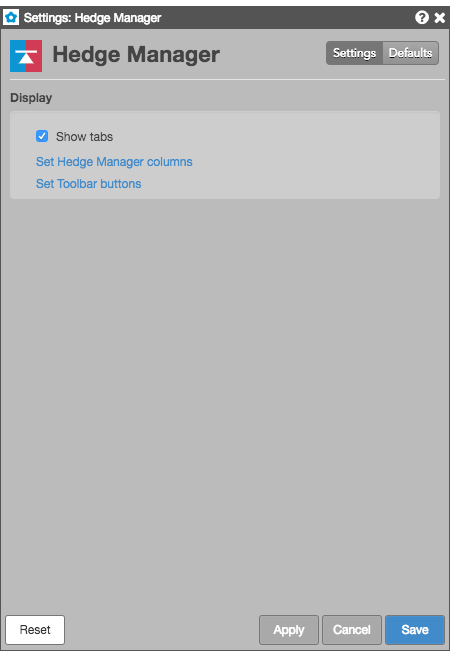 Show/Hide control panel: Determines whether to show the change order panel in the widget. Settings: Allows you to customize settings for the widget. These settings affect only the selected Hedge Manager widget. To update the default settings with these value for newly-opened Hedge Manager widgets, or to apply them to existing opened widgets, click Defaults. Cancel All Set whether to require a confirmation when canceling all orders, including all buy orders or all sell orders. Grid font size Adjust the font size to suit your preferences and use bold text, if desired. Set Hedge Manager columns Select the columns you want shown in the Hedge Manager. Set Toolbar buttons Select the buttons you want shown in the Hedge Manager. The percent of the total order quantity that has been filled. Shows a symbol to launch an OMA algo for an order. For TT synthetic and algorithm orders, the name of the algorithm controlling the order. ID of the connection used to route the order or fill. Button to change the order price to cross the inside market. TT user name of the trader associated with the transaction or owns a staged order. Date Date the order was legged. Name of the exchange. Note: For parent TT order type orders, an asterisk "*" is appended to the exchange name in this column (e.g., CME *) to indicate the intended destination of the submitted parent order. No asterisk appears in the Exch column for the related child orders sent to the exchange. Shows the value sent to the exchange as the clearing account. ID of the order, supplied by the exchange. Button to change the order price to a price level with sufficient liquidity to fill the entire order quantity. Button to launch the contract in the MD Trader widget. Type of position you are establishing with the order. ID that uniquely identifies the OMA (order management algo) order associated with the transaction. TT-generated ID that uniquely identifies a parent order. The ID is also associated with all of its child orders. For example, if you submit a TT Iceberg order, the ParentID of each child order will contain the TTOrderID of the parent Iceberg order. Button to change the order price one tick closer to the inside market. Name of the product being traded. Type of product (e.g. Futures, Options). Routing destination for the order, such as TT SIM or Algo SE. Select Check box to select specific hedge orders. Text message, typically execution instructions, included with the staged order. Canceled — In the Order Book and Audit Trail, this status indicates that the remaining balance of a partially filled order was canceled. Unfilled orders that are canceled in the Order Book also appear in the Audit Trail with a status of "canceled". Note: For staged orders, refer to Staged Order Status. The status of the parent synthetic order. Displays an optional, user-defined text value from the Setup app or entered in the TextA free-form text field in the Order Ticket. This value remains on the order in the TT system. If accepted or required by an exchange, the value in this column may be routed to the exchange for clearing and back office purposes. Displays an optional, user-defined text value from the Setup app or entered in the TextB free-form text field in the Order Ticket. This value remains on the order in the TT system. If accepted or required by an exchange, the value in this column may be routed to the exchange for clearing and back office purposes. Number of ticks the order is currently away from the inside market. Time Time the order was legged. TT-generated ID that uniquely identifies the order associated with the transaction. Deletes the selected orders, or all visible Buys, Sells, or orders. Orders hidden due to filters are not deleted. Removes all rows containing non-working filled or deleted orders. Sends a Limit order for the total size of the working hedge order to cross at the best inside market price. Sends a Limit order to for the total size of the working hedge order at the price level that would sweep the market of available liquidity. Note that the price level could be one or more ticks away from the inside market, depending on the number of levels needed to fulfill the full quantity. Selects an OMA algo to launch for the selected order. Adds a button to launch an available OMA algo. Completes a block order transaction. Reprices the selected order downward one tick. Removes an order (native or synthetic) from the market but stores it on the TT order server for later execution. Held orders are stored in short-term memory. If the order server process goes down, the held order information is lost. Until you click the Submit button the order remains held and out of the market. Sends an inquiry to the exchange for a block order. Indicates the type of position you are establishing with the selected order. Opens an Order Ticket with a replica of the selected order. You can send the same order or alter it as desired. Submits held orders to the exchange. When you submit a held order, it receives a new order number. The Audit Trail indicates if a submit fails. Reprices the selected order upward one tick. Displays the history of activity for the selected order. Claims a staged order. The user who claims the staged order is the owner. Unclaims a staged order. The user who unclaims the staged owner gives up ownership and the order is available to be claimed by another user.